while a Japanese mother and son look on. (credit) In a December speech to Congress, Roosevelt denounced the schools' order as a "'wicked absurdity,' asked Congress to grant citizenship to those Japanese immigrants who wanted it, and vowed to protect the rights of all Japanese residents in the United States." His request was not popular. 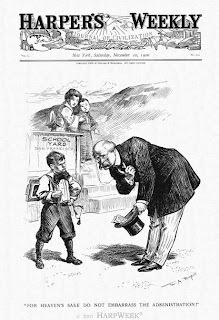 A 1907 "Gentlemen's Agreement" was entered, by which the united States informally agreed not to restrict Japanese immigration or schooling and Japan agreed not to permit further migration from Japan to the United States.